The STEEM price is up 1.89% verse the USD over the past 24 hours on lower volume ($8,105,300) as Bitcoin rises to $8.3k and the broader market is mixed. STEEM is holding ground verse Bitcoin as Korean trading falls to 28% of the trading volume. The strong downward movement of Bitcoin is the primary driver of the current fall in STEEM, wait to see if it stabilizes before STEEM moves up again. New account creation is strong with 2,200 new accounts created in the past 24 hours. The % vested indicator is down at 71.21% on steady power downs and lower power ups. Daily active accounts is up at 62,304 accounts executing transactions in the last 24 hours. SBD is at $2.23 on Bittrex which is still very elevated over the peg, receive you rewards in 50% SBD and then use the SBDs to buy STEEM on the exchange. SBD conversions are a waste of money again! 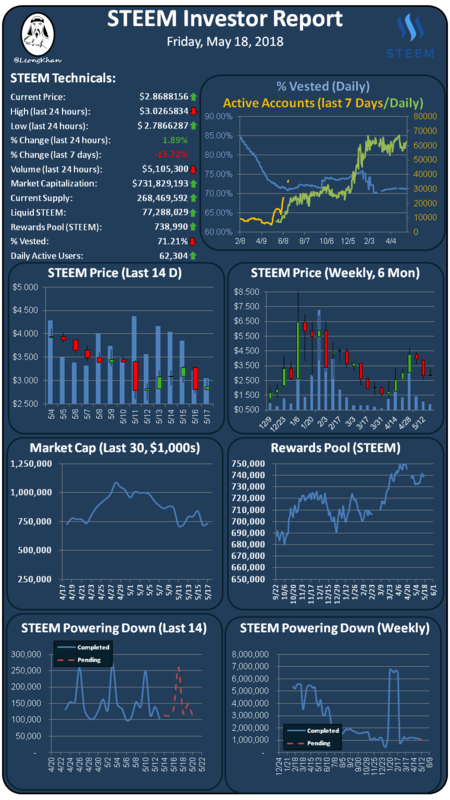 Steem is one of very few that are climbing today. That could be a good sign. What did you think of China giving steem a good rating?